Barb Sibbing at Barbsibbing.com created this Fired Up video introduction for my recent presentation of Life Matches Live at First Church Hagerstown. Thanks Barb! Dr. William A. Ward, a former member of Texas Wesleyan’s faculty, would have been a platinum Tweeter! Dr. Ward, a Methodist layperson, teacher, and author, left a legacy of quotes which show an inspired wisdom. I can do no better than offer a sample and perhaps spark you to search for more from this brilliant modern mind. “Every person has the power to make others happy. Some do it simply by entering a room; others by leaving the room. Some individuals leave trails of gloom; others, trails of joy. Some leave trails of hate and bitterness; others, trails of love and harmony. Some leave trails of cynicism and pessimism; others trails of faith and optimism. Some leave trails of criticism and resignation; others trails of gratitude and hope. “To laugh is to risk appearing a fool. I have offered all the limited wisdom I have been blessed with to share at this point. Rather than prove this fact to you with further vain attempts at inspiration, I am taking a summer social media sabbatical. Here’s to more laughing, learning and living with friends. Who knows, I might even make some new ones! If I learn anything worthwhile or if I live any interesting stories, then I’ll share the spark with you here again. If not, then thanks for reading and I hope Dr. Ward’s words will inspire you as they have inspired me to live a life that’s Fired Up! TTFN. Safe travels and happy landings! A compass tells you the direction you are heading. Here’s a mental compass that can perhaps keep you living your life on a course to satisfaction and purpose. When you find yourself directed by wanting to get something for yourself, then you are living in the direction of success. When you find yourself directed by wanting to give something to someone else, then you are living in the direction of service and satisfaction. Your give-get compass can help you decide if you are on course, on purpose and if you are appropriately using your strengths in service to yourself or in service to others. What are you seeking with this once in a lifetime opportunity called living your life? Try heading in the direction of satisfaction through giving yourself to others and you’ll be amazed at what you will receive! 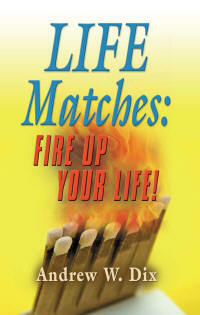 You will definitely be living your life, Fired Up!